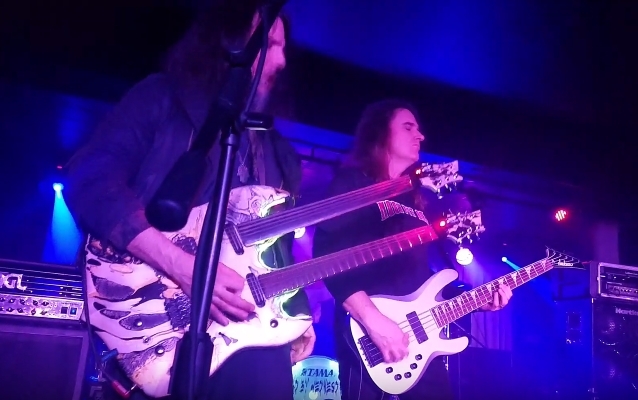 Fan-filmed video footage of MEGADETH bassist David Ellefson and former GUNS N' ROSES guitarist Ron "Bumblefoot" Thal performing cover versions of classics songs by MEGADETH, IRON MAIDEN and BLACK SABBATH on November 16 at Jewel in Manchester, New Hampshire can be seen below. 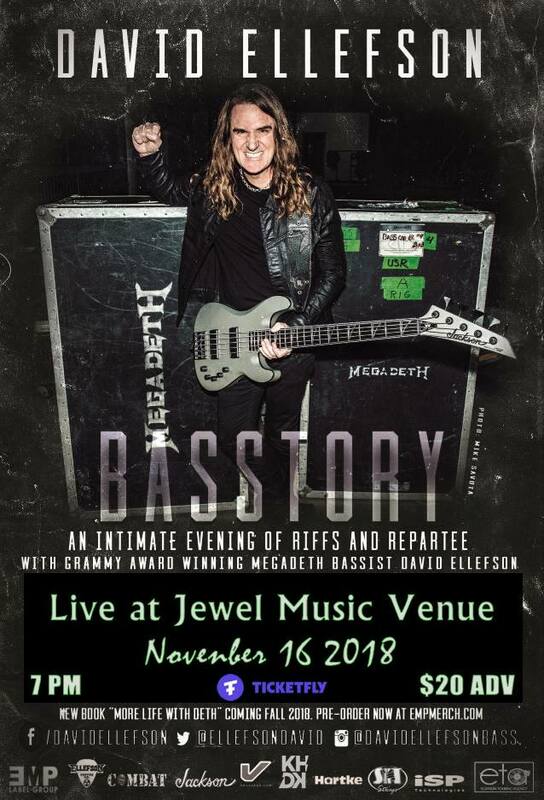 The Manchester gig was part of Ellefson's "Basstory" tour, which combines solo bass performance with David's celebrated brand of storytelling, as he recounts intimate details of his struggles and triumphs in the name of rock 'n' roll. "Basstory" also includes special VIP meet-and-greets, exclusive merchandise, and more. "Basstory" is also the launching pad for Ellefson and partner Thom Hazaert to announce the formation of their new booking agency, ETA — Ellefson Touring Agency — with veteran agent Keith Rowley personally booking the trek. Joining Ellefson and Thal on stage in Manchester were members of FIRST BOURNE and DEAD BY WEDNESDAY. Prior to the start of the trek, Ellefson said: "I have always done clinics, and a few years ago did an amazing spoken-word tour in Australia to support my book 'My Life With Deth', and have always welcomed the opportunity to be able to meet and connect with fans on a more intimate level. These important parts of my professional life converged to create 'Basstory'. Not only will fans get to hear some of their favorite bass riffs, but the stories behind them. It's not often I get to get into small, intimate rock clubs, the way this all started, and I'm excited for fans to get to experience this show."